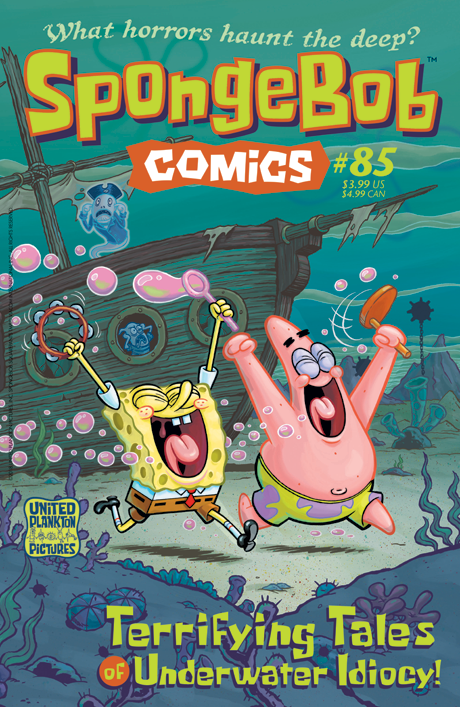 United Plankton Pictures is taking an extended shore leave, so #85 will be our last for a while. For now we present our 7th annual October assemblage of spooky submerged stories! In “Creature from Goo Lagoon,” Graham Annable (Grickle, Boxtrolls, Puzzle Agent) writes and draws the tale of a lonely monster…who makes the mistake of kidnapping Patrick to keep him company! Then, in “Dutchman Went Down to Bikini Bottom,” Derek Drymon (Adventure Time, SpongeBob SquarePants Movie) and Jacob Chabot (Deadpool Team-Up, Mighty Skullboy Army) team to show how even selling his soul can’t help Squidward’s clarinet playing. And Bob Flynn (Bravest Warriors) brings vampires to Bikini Bottom. All this plus facts about the deepest depths of the sea—by Maris Wicks (The Human Body Show) and SpongeFunnies by James Kochalka (Glorkian Warrior).